RECORD YOUR VOICE, MUSIC, AND PODCASTS! 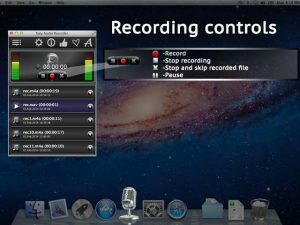 Easy Audio Recorder (the simple Audio recorder) is easy to use and will help you record high quality audio on your Mac or PC. So go ahead, set up the portable music Studio, Podcasts, and Audio Lectures and experiment with a variety of audio formats and individual settings with Easy Audio Recorder app! * Recording control: buttons for recording, Pause, Stop, Stop & Skip. * Play controls: play, Pause and Stop buttons. The play button on the right has a Drop-down menu with additional options. * Audio Input Device. Unless you customize this Option, the App will use a Standard Audio input device (e.g. built-in input). For instructions on switching to another Audio input device, go to settings and click on ” Built-in input” or watch our short video Tutorial. • Recording rate: 44100 Hz (CD quality) or 4800 Hz (DVD quality). * Channels: 1 (Mono) and 2 (Stereo). • Available audio formats: MPEG4ACC, CAF, WAV, and AIFF. * Bit rate: 64-320 kbps. With the Easy Audio Recorder you can easily record music or audio tracks, listen to them, rename them, copy them, send them. If for some reason you don’t like the way your file came out, you can put it in the trash. This way, not everything is lost if you change your mind! So, what are you waiting for? Download the Easy Audio Recorder today and enjoy everything it has to offer! Hello and welcome to the Easy Audio Recorder! This App helps you to record Audio files on your Computer and it is very easy to use. It recording controls: the red “recording” button, a Pause button, Stop and record, Stop & Skip. There is play control: Stop, Pause and multiple play Buttons. These have several options, such as view file in folder and Move to trash. Now go to settings. Unless you change your Standard Audio input device, the App will always record your Audio files using the built-in input. If you want to change that, we’ll show you how to do it. Go to the system preferences, click sound, and then select your Audio input device. These are your other customizable options: sample rate, channels, Audio formats, and Bitrate. If you want to rename, copy, or send your Audio file, click Go to where the file is stored. We can get there from settings or from the play button on the right. If you don’t like the way your file came out, you can move it to the trash. This way, you will still be able to access it if you change your mind later. And now, Ready, set, go – start your recording!